Juan Pablo Romero (right), founder and director of Los Patojos, talks with current student Christopher Alvarado, who participates in the construction and maintenance of the new campus during the mornings in Jocotenango, Guatemala. 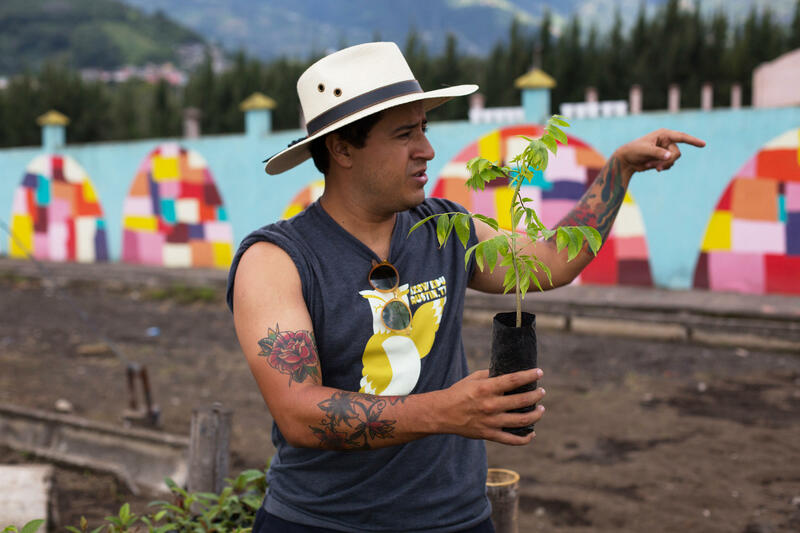 Juan Pablo Romero holds a young plant which, when fully grown, will be used as renewable firewood. 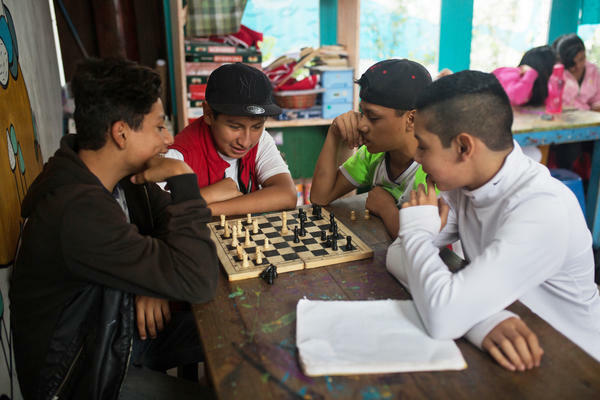 Teenagers play chess during a break at the main Los Patojos campus. Fourth graders prep dough to bake during a cooking class. Los Patojos has grown into a community center and school educating over 300 students. Pre-elementary school children look through workbooks. In Guatemala, where childhood is threatened by poverty, gang violence, drug addiction, and generalized low self-esteem, Los Patojos is seen as a ray of light. Current students Steven Garcia (left), 16, and Luis Hernandez, 15, help construct around the athletic field in Los Patojos' new campus. 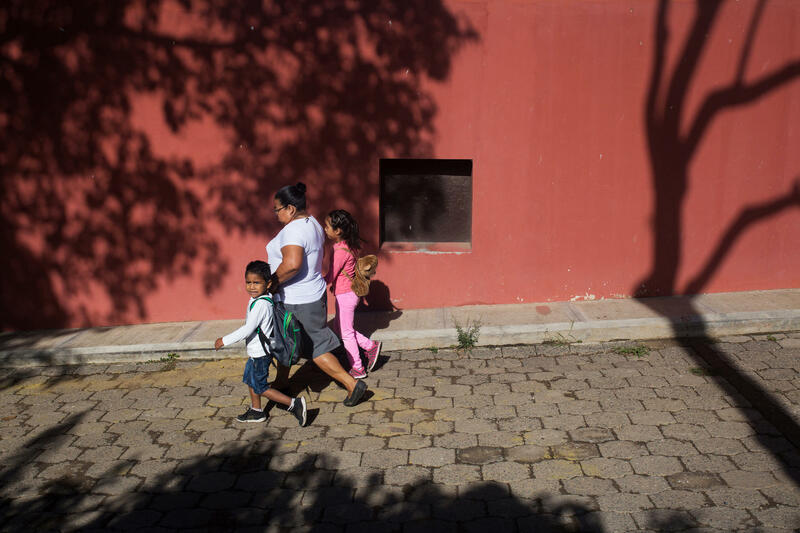 A woman walks two children in Jocotenango. 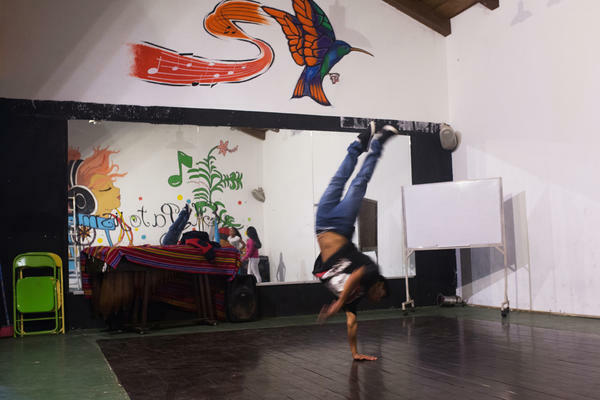 Jonathan Ramirez, 16, breakdances at Los Patojos. "We have four fundamentals here," says Rafael Fuentes, the education coordinator, "food, health, education and art. For us, art is just as important as math." 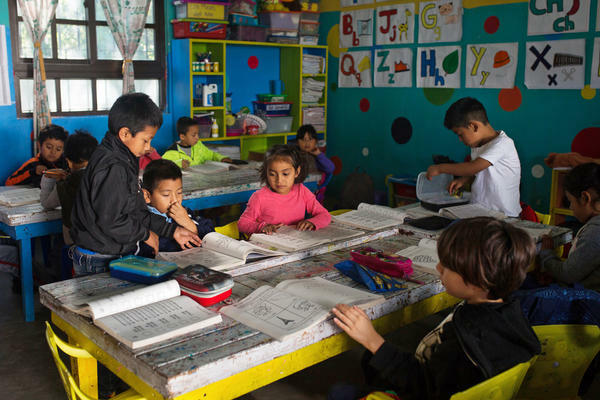 The main school building — with its sunny courtyard and colorful murals — is located in the town of Jocotenango, about an hour from the capital of Guatemala City. On the day I visit, the littlest students are racing around in homemade cow costumes as part of a student performance taking place later that day. Los Patojos is in the mold of Montessori and Waldorf schools. It focuses on the whole child — the intellectual, the artistic, the physical and the practical. Teachers show the students how to bake bread, to take photographs, to frame a building — and they also instill pride of place. "Guatemala wants to become Mexico. Mexico wants to become the United States. The United States wants to become Europe. I don't want to become anything. I want to become Guatemala," says Juan Pablo Romero Fuentes. He is the 34-year-old founder of Los Patojos and its unlikely headmaster. His arms are heavily tattooed, he careens around the cobblestone streets in a beat-up 4Runner, he dresses like a rock guitarist (which he used to be) and he f-bombs his way through interviews. "I want to show my kids that we come from Mayas," Romero continues. "They built a f*****g civilization out of their own ideas. I believe these kids will have that feeling again of, 'Hey, I'm able to do something by myself.' "
Romero considers himself more of a rebel or social activist than an educator. He started out as a teacher at a Catholic school in Guatemala, but became frustrated with the confining parochial traditions. "I saw all these beautiful minds oppressed. I just didn't feel able to be myself," he says. He started inviting kids from the streets of Jocotenango to his parents' middle-class house. That grew into a community center that offered classes and a performance space. More and more kids showed up. He attracted the attention of international donors like Just World International and the Give Kids a Chance Foundation, who helped him build a real school. In 2014, he was the only Latin American to be selected for a "hero award" by CNN, which brought more international exposure. In Guatemala, where childhood is threatened by poverty, gang violence, drug addiction and generalized low self-esteem, Los Patojos is seen as a ray of light. "We have four fundamentals here," says Rafael Fuentes, the education coordinator, and a cousin of Romero's, "food, health, education and art. For us, art is just as important as math." The day I visit, the school is celebrating its twelfth anniversary. Each class performs a different dance routine. The student audience applauds wildly for the dancers. The 350 children — ages 4 to 17 — seem unusually energetic, even euphoric. That may partly be due to the school's bedrock principle: A child must be healthy and nourished in order to learn. Patojos has its own clinic where a doctor monitors students' weight and health. A kitchen staffed by students serves breakfast, lunch and dinner every day. Moreover, the school does not shelter its students from the often negative news that comes out of Guatemala. Teachers encourage them to stay informed and discuss headlines. "Here, we learn what is happening in Guatemala and around the world," says 12-year-old Luis Julian Montufar. "In public schools, they brainwash you and tell you all the good things the president is doing." He then launches into a critique of President Jimmy Morales' recent controversial cancellation of a UN-backed anti-corruption commission that was investigating the president's own family. At this point, you're saying: Great! But who pays? Los Patojos relies heavily on international and domestic donors. Romero is the first to admit he spends a lot of his time fund-raising. "I need money and that's the big challenge," he says. "My job is to always keep finding investment, donations and partnerships." Up to now, he says, schooling has been free. They're about to initiate a modest tuition for the upper grades. Romero has ambitious plans. 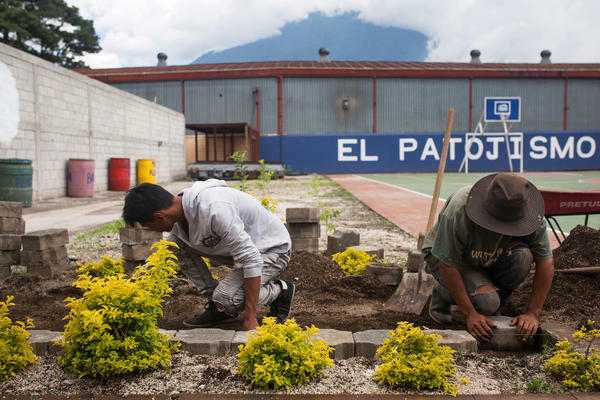 He is building an additional campus a few miles away in the shadow of the smoke-belching Fuego volcano. That campus is being built by a team of seven teenagers — all of whom he says were wild boys from the streets. They're now learning about construction and horticulture. 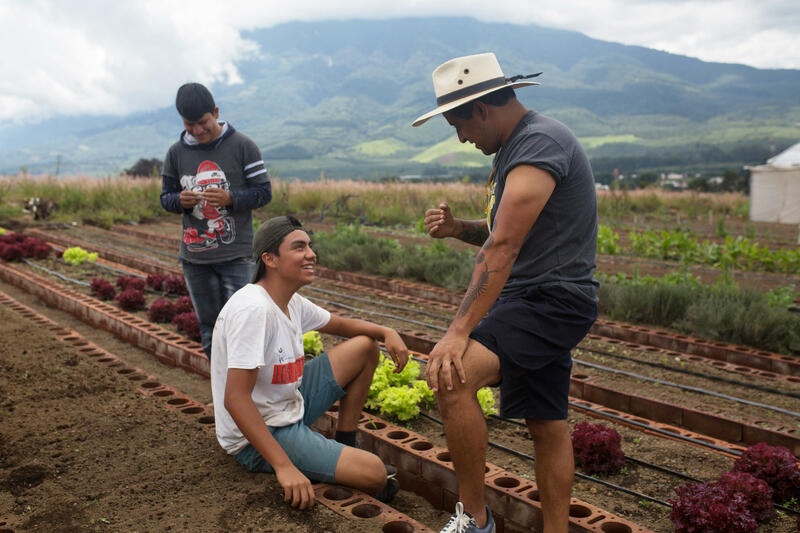 The vegetables they're growing in the rich volcanic soil will be sold in town and served in a student-run café with the proceeds plowed back into the school. Ideas for six additional campuses across Guatemala are swimming around his head. "We're not just educating kids," Romero says, "we're also giving them all the resources to make their businesses. I'm not afraid of being called a f*****g capitalist. I need to pay the bills." Four years ago, the Guatemalan Education Ministry recognized Los Patojos and began accepting its diplomas. The school is only a dozen years old so there haven't been many graduates. Romero says ten kids have left Los Patojos and moved into the workplace. In Guatemala, the Maya built pyramids, invented a writing system, and developed a calendar. Juan Pablo Romero believes the seeds of genius are still here. They just need watering. Imagine a small, developing nation with a severely lacking education system. Schools are poorly funded. Students can't afford tuition. Fewer than half of indigenous girls attend school, and they often drop out. These are the schools of rural Guatemala. Now, picture a firebrand educator who thinks he has a way to reinvent those schools. As NPR's John Burnett reports, he's starting to turn heads. JOHN BURNETT, BYLINE: Patojos is a Guatemalan word for little ones, and here they are on this day dressed as cows and acting the part. BURNETT: The main school building of Los Patojos, with its sunny courtyard and colorful murals, is located in the town of Jocotenango about an hour from the capital, Guatemala City. Patojos is in the mold of Montessori and Waldorf schools. It focuses on the whole child - the intellectual, artistic, physical and the practical; teach young people how to bake bread, how to take photographs, how to frame a building, how to instill pride of place. JUAN PABLO ROMERO FUENTES: Guatemala want to become Mexico. Mexico want to become Estados Unidos. Estados Unidos want to become Europe. I don't want to become anything. I want to become Guatemala. BURNETT: Juan Pablo Romero Fuentes is the 34-year-old founder of Los Patojos and its unlikely headmaster. His arms are heavily tattooed. He careens around town in a beat-up 4Runner. He dresses like a rock guitarist, which he used to be, and he f-bombs his way through interviews. J. FUENTES: I need to show my kids that we come from Mayas. They built a [expletive] civilization out of their own ideas. So this is how I believe these kids will have that feeling again of, hey, I'm able to do something by myself. BURNETT: Romero considers himself more a rebel or social activist than an educator. He started out as a teacher at a Catholic school but became frustrated with the confining parochial traditions. J. FUENTES: I saw all these beautiful minds oppressed. You know, I just didn't feel able to be myself. BURNETT: He started inviting kids from the streets of Jocotenango to his parents' middle-class home that grew into a community center that offered classes and a performance space. More and more kids showed up. He attracted the attention of donors like Just World International and Give Kids A Chance Foundation, who helped him build a real school. In 2014, Romero was the only Latin American to be selected for a Hero Award by CNN. Here in Guatemala where childhood is threatened by poverty, gang violence, drug addiction and generalized low self-esteem, Los Patojos is seen as a ray of light. 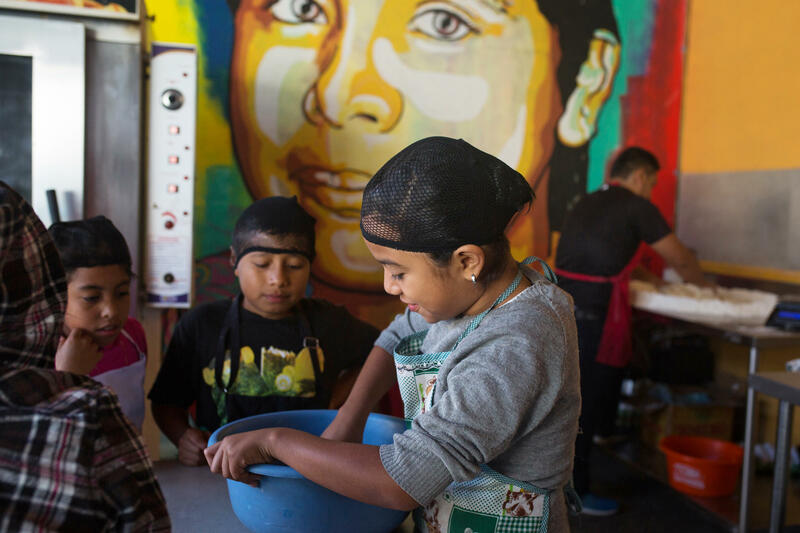 BURNETT: "We have four fundamentals here," says Rafael Fuentes, the education coordinator, "food, health, education and art. For us, art is just as important as math." BURNETT: The day I visit, the school is celebrating its 12th anniversary. Each class performs a different dance routine. BURNETT: The student audience applauds wildly for the dancers. The 350 students here, ages 4 to 17, seem unusually energetic, even euphoric. That may be partly due to the school's bedrock belief - a child must be healthy and nourished in order to learn. BURNETT: Patojos has its own clinic where a doctor monitors student health. A kitchen staffed by students serves breakfast, lunch and dinner every day. Moreover, the school does not shelter its students from the often negative news that comes out of Guatemala. Teachers encourage them to stay informed, discuss the headlines. LUIS JULIAN MONTUFAR: (Speaking Spanish). BURNETT: "Here, we learn what's happening in Guatemala and around the world," says 12-year-old Luis Julian Montufar. "In public schools, they brainwash you and tell you all the good things the president is doing." He then launches into a critique of President Jimmy Morales' recent controversial cancellation of a popular anti-corruption commission. At this point, you're asking great, but who pays. Los Patojos relies heavily on foreign and domestic donors. Romero is the first to admit he spends a lot of his time fundraising. J. FUENTES: But I need money, and that's the big challenge. My job is to always keep finding investment, donations and partnership. BURNETT: Up to now, he says, schooling has been free. They're about to initiate a modest tuition for the upper grades. Romero is building an additional campus a few miles away. The work is being done by a team of seven teenagers, all of whom were wild boys from the streets. They're now learning about construction and horticulture. The vegetables they're growing in the rich volcanic soil will be sold in town and served in a student-run cafe, with the proceeds plowed back into the school. Ideas for six additional campuses across Guatemala are swimming around his head. J. FUENTES: We're not just educating kids but also giving all the resources for these kids to make their business. So I'm not afraid of being called [expletive] capitalist, and I don't care. I need to pay the bill. BURNETT: Four years ago, the Guatemalan Education Ministry recognized Los Patojos and began accepting its diplomas. The school has only a dozen years old, so there haven't been many graduates. Ten kids have left Patojos and moved into the workplace. Many more are in the pipeline. In Guatemala, the Maya built pyramids, invented a writing system and developed a calendar. Juan Pablo Romero believes the seeds of genius are still here. They just need watering. John Burnett, NPR News, Jocotenango, Guatemala. Transcript provided by NPR, Copyright NPR.